The new bundle will hit stores in early October. If you haven't gotten caught up in the tornado that is Fortnite's hype, there's a new opportunity to join up with millions of others. 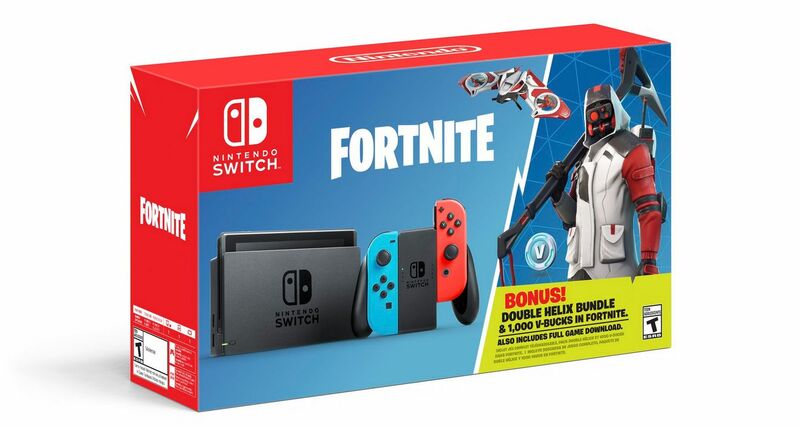 Today, Nintendo revealed the $299.99 Nintendo Switch: Fortnite - Double Helix bundle and it includes some in-game content and currency to get players going. It will launch on October 5, 2018. Whether you're one of the few without a Nintendo Switch in your collection of consoles or you simply have the exposable income to grab this bundle because your Switch has some wear and tear, this Double Helix bundle is delivering the goods. Beyond the hybrid console itself, the Fortnite bundle includes 1,000 V-bucks for in-game purchases, and the Double Helix set featuring a unique character outfit, back bling, glider, and pickaxe. The official listing on the website suggests buying a Battle Pass with your V-bucks, which will net you access to more in-game content. There's a handful of new original games coming to the Nintendo Switch alongside a plethora of previously released games coming over from other platforms, but, thankfully, Nintendo is taking the steps to make the older titles worth the purchase by including unique items as incentive. Games like Starlink: Battle for Atlas are getting entire unique Nintendo characters, this one is the form of Fox McCloud from Starfox. Stay tuned to Shacknews for additional updates.